Corals and the microbes they host evolved together, new research by Oregon State University shows. The findings, published today in Nature Communications, add fresh insight to the fight to save the Earth's embattled coral reefs, the planet's largest and most significant structures of biological origin. Funded by the National Science Foundation, the study involved hundreds of samples of scleractinian corals—also known as stony corals—which since their first appearance 425 million years ago have branched into more than 1,500 species. Many of those are major builders of coral reefs, which are found in less than 1 percent of the ocean but are home to nearly one-quarter of all known marine species. Reefs also help regulate the sea's carbon dioxide levels and are a crucial hunting ground that scientists use in the search for new medicines. "Many corals have gone extinct during industrialization and many others are threatened with extinction," said study co-author and OSU microbiologist Rebecca Vega Thurber, who is featured in the 2018 Oregon State University-produced documentary "Saving Atlantis." "If we see patterns of evolution between microbiomes and corals, that gives us an idea of which microbes to target—to learn what they do, how they help corals resist climate change, and how they help to buffer against nutrient pollution. We can look in more depth at the microbes and understand how they help or hurt their hosts." "Likely the ancestral corals also harbored complex microbial communities but there's a lot we don't know about how these coral-microbe symbioses evolved or the key factors influencing microbial communities in modern corals," Vega Thurber said. "Certain species of corals have distinct microbiomes, to the point where that occurred at some point in their evolutionary history. Not 400 million years ago, but there are specific groups of microbes that do show very strong evidence of evolving with their hosts more recently." Vega Thurber and Ryan McMinds, a Ph.D. student in her lab and co-first author of the paper, were part of an international collaboration that also included Penn State University's Monica Medina and former Oregon State post-doctoral scholar Jesse Zaneveld, now an assistant professor at the University of Washington-Bothell. "On a lot of different scales, the more similar the coral hosts, the more similar the microbial communities are—both the whole community and particular microbes," McMinds said. "We collected samples from as many kinds of corals as was possible. For every sample set, we looked at the corals' tissue, skeleton and mucus to see what microbes were there." To do that, the researchers sequenced the 16S rRNA gene. The gene is present in every living organism, McMinds explains, but is slightly different. He likened it to a "molecular bar code" of each organism it belongs to. From there, the scientists could look for patterns between different corals' microbial communities and determine whether co-evolution of the corals and their microbiomes had taken place. "We found strong support for coral-microbe 'phylosymbiosis,' in which coral microbiome composition and richness is reflected in coral host's evolutionary history," Vega Thurber said. "When speciation for modern reef-building coral families began between roughly 25 million and 65 years ago, that was accompanied by large changes in microbiome richness. And changes continued to accumulate during more recent speciation events." Coral diversity is too great for assessing the various factors that maintain the microbiome of every single coral species, but these findings provide general rules for microbiome assembly "that inform estimates of the effects of microorganisms in understudied portions of the coral tree." "Now we have a framework for analyzing scleractinian coral microbes that can reveal how the corals' evolutionary history, host traits and local environment interact to shape microbiomes," Vega Thurber said. "In the coral world, there's been a longstanding hypothesis that microbes and coral co-evolved, but there hadn't been a sufficient data set to test that before now." It was something of a surprise to researchers to find that the microbial communities of the corals' calcium carbonate skeletons showed greater microbiome richness compared to the tissue and mucus microbiomes. Also, the skeletal microbiomes displayed the strongest signal of long-term phylosymbiosis—a pattern in which the diversification of a related group of host organisms correlates with changes in dissimilarities among their microbiomes. 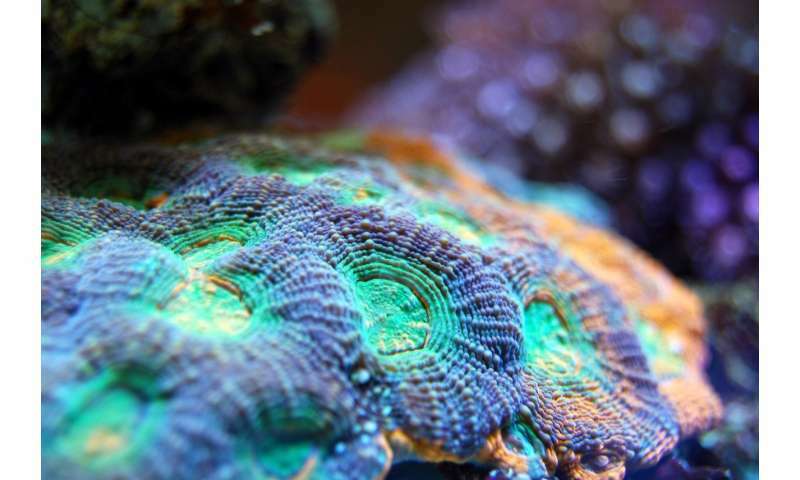 "We originally thought corals would show signs of phylosymbiosis throughout their entire phylogenetic history, and the results support that for the skeleton and tissue but not the mucus," McMinds said. "Despite variability in the chemical composition of mucus between species and significant host-specificity in the mucus microbiome, host specificity was limited to relatively recent divergences." He also noted the research found potential significance in "a few groups of microbes no one had thought were important to look at." "There are thousands of different species of microbes and not that many that researchers have thought were interesting, and we identified a couple of other microbial targets that might be influencing coral health," McMinds said. "We don't know for sure if they are important, but evidence suggests they're changing along with their hosts, so it's probably something important they're doing. They're not a standard symbiont but it seems they're something worth looking at more closely."